For me the right ankle boots and transform any outfit to instant cool. However, find the right pair is not an easy task. I tried a few styles including the Acne Pistols which I have loved but they were still not perfect for me. The sizing was weird, runs very big and super heavy. The Pistols also seems to overwhelm my petite 5 feet 3 frame. I sold the pair after wearing them for 4 years and my painful hunt for another pair of ankle boots begun. Pointed toe or almond toe - Pointed toe gives the illusion of length and a little more edgy and contemporary, almond toe is a classic shape and suits all occasion. Ankle - If you are short, find a pair that sits right above your ankle, not too high on your calf. The idea is to lengthen your legs. Acne Studios does the best boots in my opinion, other than Pistols their new superstar are the Jensen (worn in the picture above). 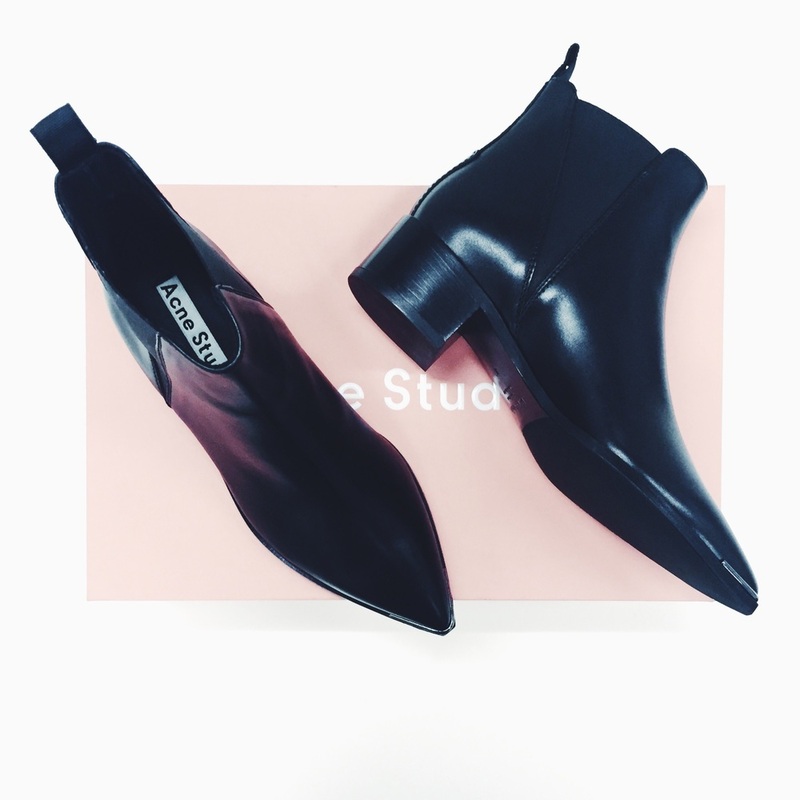 These bad boys my dream pair of flat ankle boots. Pointed toe with pulled up tabs and the metal on the cap is the perfect touch. The pointed toe seems to make me look taller and instantly elevate any of my norm-core outfit. I wore this with jeans and skirt. They are sturdy and went to Europe with me. I think the boots earned me a spot on Into The Gloss' pinterest board. The price has increased and they are always sold out, so I was lucky to score them last year when Net-A-Porter priced them really well (by well I mean wayyyy lower than other retailers) and I had a generous gift voucher from my ex-colleagues. If you see them for less than $700, grab them! I rely on ShopStyle to find the lowest prices. I am lusting over a pair of heeled ankle boots, my dream pair would be this badass Saint Laurent boots but the price is way above my budget. I came across these beauties on & Other Stories (pictured above) because I am always on their beautiful website. Because they do not ship to Australia, I tried searching for alternatives locally but I couldn't stop thinking about this pair. My good friend Nat from Antwerp is kind enough to purchase and mail these bad boys to me. This pairs look identical to my Acne Jensen's cousin, but taller. I am so impressed with the quality, these pair are very well made but the price. They are perfect. Another alternative pair that I like are the Acne Loma but the heel is not high enough. I hope you enjoy this post, please leave any comments or questions!